Case Study—innovative solutions to new, faulty, artificial baseball infield - Alpine Services, Inc.
A state university purchased an artificial turf varsity baseball infield that failed shortly after it was installed; water was standing on it in multiple places due to poor grading. Clearly this required an innovative solution. 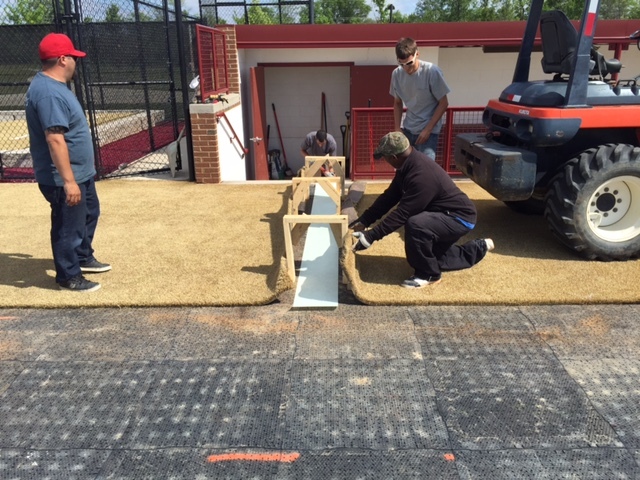 The construction profile included a graded sub-base, waterproof liner, drain board, and crumb rubber filled artificial turf. For cost reasons, the turf had to be reused and it had baseball line markings inlaid in it. Furthermore, it was extremely heavy to move, etc. There existed no body of knowledge relating to the removal & replacement of turf that contained infill (excessive weight) nor methodology of accurately indexing each panel of turf relative to the contiguous adjacent panels. The drain panels under the turf were not mentioned or known to exist when the project started, and were a surprise discovery. Teates developed a plan to include the indexing of each turf panel relative to all contiguous panels and then the careful removal of each filled turf panel. Thousands of plastic drain panels had to be indexed before they were removed and stored in an organized manner. 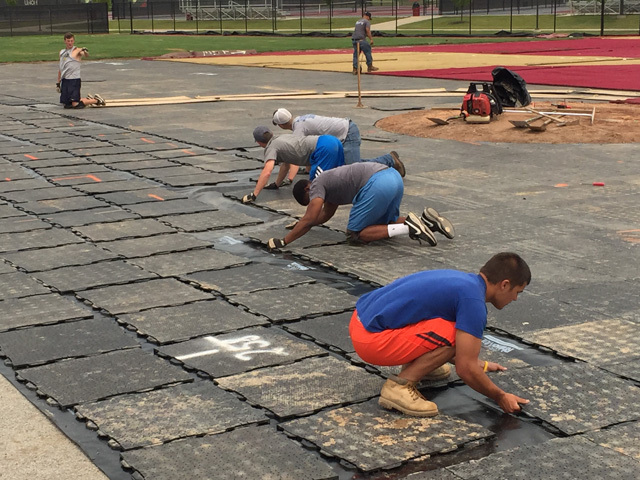 The grading and drain issues were easy to resolve, the drain panels were replaced, and the methodology and tools/equipment needed to position each heavy turf panel (13.5’ wide x 40’ long) were developed. Since the panel weight was beyond human capabilities and this type work had not been done before, Grove’s solutions were original, untried, and needed to be implemented immediately. This need led to the development of the “Turf Winder/Unwinder,” which neatly rolled the turf plus its infill and then, later, unrolled it, as well as the “Turf Placement Device,” which was attached to an excavator. The excavator had the strength to move the turf panels to within 1/8” of exactly where they needed to be and it did not get tired! These unique devices made the project possible and are a result of Grove’s unconventional thinking and a “get it done” attitude. 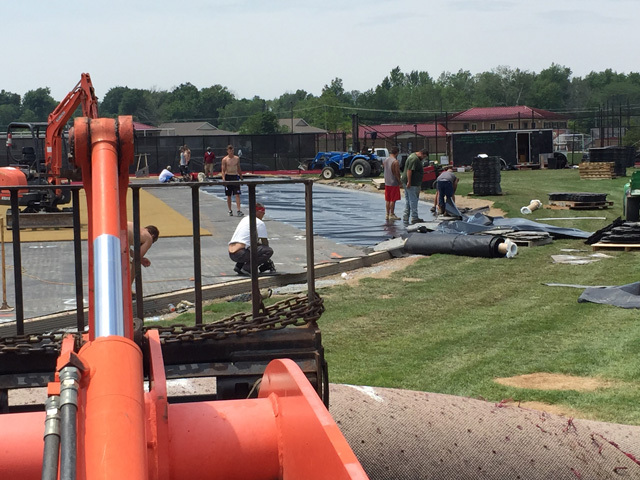 The client received a true grade on its infield, saved considerable money by re-using the turf and drain boards, and was able to accomplish this in six weeks between the end of the baseball season and the beginning of baseball scholarship tryouts. This job presented myriad challenges which were met and satisfied with innovative solutions that demonstrated the unique abilities of Teates to react to significant challenges, under time constraints. Grove added the knowledge he gained to his storehouse of conquered challenges, which is available for the future. Important note: Significant energy could have been saved if Teates had been asked to examine the initial plans and inspect the actual work performed daily during the first installation. Much angst, money, and six weeks of time could have been eliminated. Installing new, accurate outside curb on the infield arc.